George A. and Bertha Cecil Gordon, descendants of two early farmers of the Davisville area, built this home. William Y. Gordon farmed 160 acres of land southeast of Davisville starting in 1857. Being a carpenter and iron worker by trade, he built his own buildings and played an important role in the construction of the Tremont Church. William Y. Gordon was originally from Vermont, and he returned there to marry Jane Phelps. He brought her back to a new home he had constructed. They had five children: George A., William. B, Ira, Mabel, and Florence. George A. and William B. married sisters, Bertha and Belle Cecil, daughters of Burlin and Eliza (Lillard) Cecil of Davisville. George A. and Bertha Cecil Gordon built this house in approximately 1925. The land was purchased from the Porters. A house that was located on the property was torn down in order to built the current house. Their son, Buryl Gordon married Violet Raabe. They had one daughter, Margaret (Mrs. Jerry Kautz). In 1939, Margaret was only three years old when her father died as a result of getting hit by a baseball. After Buryl Gordon’s death, Violet, and her daughter, Margaret, moved in with her in-laws. 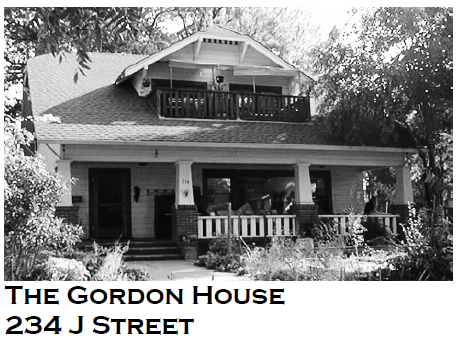 Norman and Muriel Andrews Remembers: The Gordons were a fairly wealthy family in Davis. Mrs. Bertha Gordon often had afternoon tea parties that she hosted at her house. The Andrews remember how the city street cleaners always seemed to show up the morning of Mrs. Gordon’s parties, and make the area nice and clean. This one and half story Craftsman house has a jerkinhead gable roof, with a massive roof plane facing the street. In the center of this roof plane is a large jerkinhead dormer which faces a balcony that is recessed into the roof. The recessed front porch has brick pedestals supporting battered wooden posts. The porch and balcony rails are simple wooden slats. A. large grouping of windows runs along the south side of the front facade under the porch. The overall composition of the front facade is symmetrical aside from the front door and window configuration. What has happened since the Gordon’s lived here? Violet and Margaret Gordon moved out in the early 1950s to a house on J Street, just north of 5th Street. Bertha Cecil Gordon preceded her husband George A. Gordon in death. George A. Gordon died in 1965. At that time the house, the house and the four lots were sold to Gunter and Frances K. Zweig. In 1971, the house and four lots were sold to Ursula H.K. Abbott. In 1980, she deeded the land to the Davis Art Center. A housing cooperative, the Solar Community Housing Association bought the house in 1986. The exterior of the house has undergone very few changes over the years. Sometime after 1953, the garage, tank house, and grape vineyard that were located on the lot to the south of the house were torn down and the apartment house was built.